I work with many engineers: software, mechanical, and electrical. It is truly an honor to work with them and watch them tackle challenges. They have a distinct approach and they love attacking problems. Never do they throw up their hands and say, "I don't know!" or give up on a challenge. So, for today's lesson I decided to try a fun event to really get them talking and working. On Dave's ESL Cafe, he has a lesson plan called "Protect your egg" and I thought it was perfect for Easter. It appears the lesson is originally from the book Business English Recipes by Judy Irgoin. Sadly, the book is not available digitally so I haven't reviewed it. The basic lesson is simple. 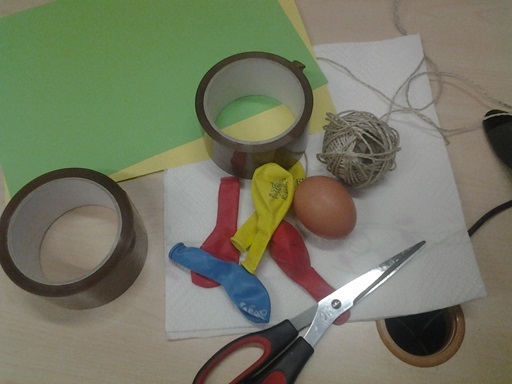 Pairs are given string, tape, two balloons, two pieces of A4 paper, and a raw egg. 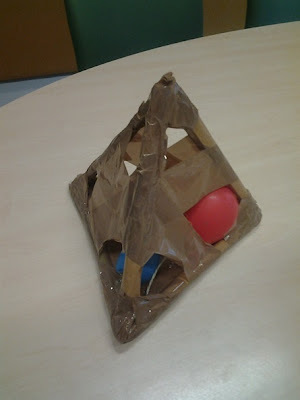 The task is to construct a device which protects the egg when dropped from arms length. The only rule is that the egg must fall freely and cannot be lowered to the ground with the string. Then they were off to the races. I stepped back and let them at it, assisting only with slight corrections and unobtrusively boarding lexical gaps. In one group, I called a short timeout during the planning/building to replace the word "fix" with better options like "attach", "secure", "stabilize", etc. The egg was suspended with strings in the center of the tetrahedron. The bars are made of rolled paper. In total, we dropped nine eggs. Four did not survive the fall intact and we broke two during construction... bring paper towels. An added benefit of the lesson was that it has helped draw the students to their new course site. I have spent considerable time building material and creating the website. Of course, adoption takes time. To pull interest, I took pictures of the them holding their designs and then posted a recap of all the projects at the end of the day. They were intensely curious and nearly everyone logged in within an hour of sending the email notification that it was uploaded. For many, this was their first login to the site. Also, the restriction on the stronger groups by outlawing the word "I" was outstanding. It eliminated the "I think, --- Well, I think" exchanges. Afterwards, we discussed how avoiding "I" generated more ideas and dialog because the suggestions were no longer personal property. So, a wonderful day with lots of laughs and great language. Thanks to Judy Irgoin and Dave's ESL Cafe for creating and sharing this lesson for my engineers. Have a Happy Easter! PS - My apologies for the blog slow down. I am working on a large CPD project for BE Trainers I hope you will enjoy... more to follow.